3) Hafrashat Challah (Separation of the challah dough.Those who bake challah are commanded to break off a piece of dough and recite a blessing before baking the challah. That piece of dough gets wrapped in a foil and burnt). Place yeast and sugar in a small bowl. Add the water and stir. Set aside for 5-10 minutes until bubbles form. In a standing mixture (if you don’t own one, then use a spatula to combined ingredients and your hands for kneading ; about 15-20 minutes), add whole wheat flour,2 eggs,oil,cinnamon, and honey. Make a well in the center and pour in the yeast mixture. Mix till well combined. Slowly add the bread flour and knead using the dough hook attachment until dough texture is elastic. Add a little more flour if necessary.Add some water if the dough is too dry. Transfer dough to a greased bowl. Cover dough loosely with a damp towel or saran wrap and set aside in an non-drafted area for 2:45 -3 hours or until double the size. Preheat your oven to 350 degrees F. Punch dough down. Break off a piece of dough and put aside. Shape the remaining challah dough and place them on a cookie sheet. 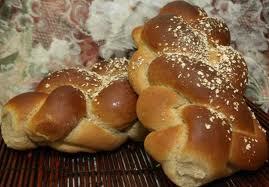 Brush with egg wash and sprinkle seeds or cinnamon-sugar on top of each challah. Bake for 30-35 minutes or until golden brown. Remove from oven and set aside to cool.